A notice conveying the ‘instruction’ with the signature of the Registrar has been put up at several places inside the University premises on Tuesday. Students at Jaffna Univ during a previous protest. (MELBOURNE) - Even ten UNHRC resolutions in Geneva will not bring freedom of expression and movement to the Eelam Tamils. Now that the Tamil students are free from their academic studies, they will not be allowed to conduct any Mullivaaykkal function anywhere else in the Tamil Homeland. As if this is not enough to stifle the freedom of expression of the Tamils, no church or temple bells will be allowed to toll during this period. No memorial prayers could be held in the temple or church premises. Any symbol of reference to the dead martyrs or civilians will invite arrests. No Tamil is allowed to remember the dead martyrs or civilians. They are not even allowed to remember the dead or missing kith and kin. How cruel and mean the Sinhalese can be! Please read the Tamil Net report below. 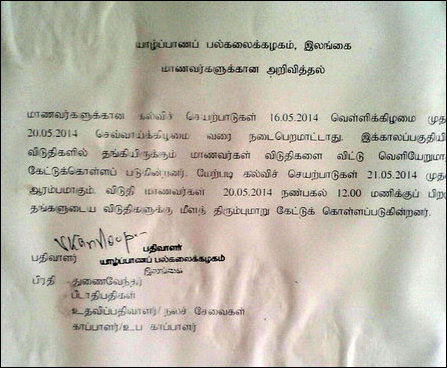 The Registrar of the University of Jaffna Mr V. Kandeepan, has issued a notice instructing the students at the University hostels to vacate the premises between 16 May and 20 May without citing any reason. All the education activities have also been cancelled for four days, bringing the entire University to a standstill during the Mu’l’livaaykkaal Remembrance this year. The instruction has come from the Sri Lankan military, informed sources told TamilNet. Since 2009, the University student community has been fighting for the collective right of remembering those who sacrificed their lives in the Tamil struggle. In the meantime, the Eastern University in Batticaloa is already at a standstill as Tamil students have been protesting against the Vice Chancellor for collaborating with the genocidal regime of Colombo. The Eezham Tamil students and the academics organised in the teachers union have been marking Mu’l’livaaykkaal Remembrance on 17 and 18 May and the Tamil Heroes Remembrance Day on November 271. The instruction to shut down the University was passed to the Vice Chancellor Ms Vasanthy Arasaratnam from Palaali military base, according to informed sources. The University was also closed during the Tamil Heroes Remembrance Day last year. The SL military intelligence recently entered the premises of the University under the cover of policing the Sinhala students in a dispute. The Jaffna University Student Union had condemned the military interference. The SL military intelligence has been deploying the Sinhala students to keep the Tamil students threatened inside their Universities in Jaffna and Batticaloa. The education activities are already at a standstill at the Eastern University as the Eezham Tamil students in Batticaloa had voiced against the Vice Chancellor for suppressing the students from mobilising against the injustices taking place at the University. All education activities have been cancelled and the students are instructed to vacate the hostels for 4 days between 16 May to 20 May.